Whether this is your first time attending AWS re:Invent or you’re a seasoned registrant, it’s beneficial to learn from the experiences of others. As event sponsors and attendees for three years in a row, the Relus Cloud team knows that sharing is caring. 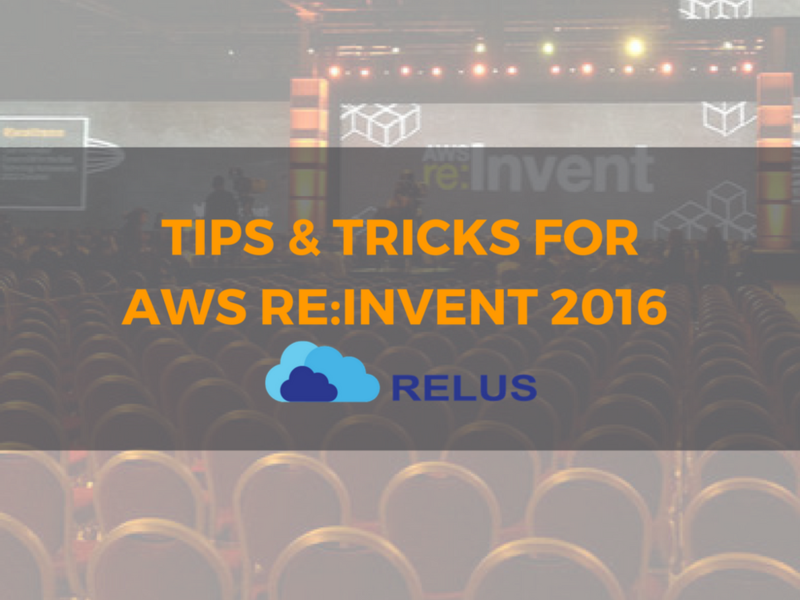 Take a look at the tips and tricks we collected to help this make 2016 re:Invent your best conference experience yet! What should first-time attendees do to prepare for the event? The rules for attending sessions have changed this year, so if you’ve heard from colleagues in the past that the thing to do is get in line early, that strategy may not work this year with the pre-registration and waiting lists. Have a plan for specific sessions you want to attend and make sure you register in advance! Once you select sessions of interest, make sure to sign up for a variety of tracks in those sessions. Don’t be afraid to step outside of your comfort zone! A developer should try to attend a few business track sessions. A sales team member or executive would likely benefit from sitting in on a few developer sessions. This strategy continues to be beneficial for unexpected inspiration and information. Double check that you have all of the chargers you need, as well as portable power. Forgetting your laptop charger may result in spending half of your day and too much money in search of a universal charger. Also, unless you want to burn more calories, the walk from the show floor back to your room can be very long! Grab what you'll need for the day before getting started each morning. You’re about to exchange contact information with more new people than you are likely to remember. We suggest setting up a separate email address (for example “name-reinvent@company.com”) for your new contacts to reach you. Ask your company administrator to set up a rule for emails coming to that address to redirect into a re:Invent folder in your actual inbox. This will help filter out marketing emails you didn’t sign up to receive and allow you to connect with valuable contacts. It’s a great way to keep conversations and priorities organized. What pro tips will help them navigate the conference once they arrive? Download the AWS Reinvent phone application. It will have maps and session times and is rumored to be more interactive this year. It’s beneficial to arrive one day before the conference begins. Early arrival allows time for extracurricular activities (golf, shop, rent a Lamborghini, etc. ), get organized, and acclimate yourself with the venue. If you arrive the first day of the conference, don’t get there too early in the day. Everyone arrives early on the first day and it can be chaotic. Just be sure to prioritize attending the opening night networking event. The vendors are most energized and available on the first night, so it’s an ideal time to have a meaningful conversation. If you are one of the lucky few to be attending and others wanted to go from your team, be sure to stop by the partner booths and pick up a few swag gifts for them. Speaking of swag, you’ll have plenty of time to gather the goods. Take your time and spread it out during the conference so you don’t find yourself carrying around too much at once. You’re going to hear brilliant content and announcements from thought leaders and won’t want to miss a word they say. While it will be tempting to take detailed notes and snap photos of important slides, take time to just focus on what is being said without capturing it all. Every announcement and presentation will be available online, including SlideShare, so you will have access to them later. It would be wise to jot down specific slides and presentations you want to reference later, but don’t worry about trying to catch all the information at once. Are there any follow-up tips you’d offer for after the conference? Review your notes of the sessions that are extra valuable so that you can re-watch them on YouTube and SlideShare. There’s so much information and new ideas being thrown at you that there’s absolutely no way to retain it all. If you make a real connection with someone at the conference, perhaps during a meal or the pub crawl, don’t be afraid to reach out to them for a conversation or a tip when you get back to the office. This is a great place to meet like-minded individuals who are open to bouncing ideas off one another or answering technical questions. Avoid collecting people for your LinkedIn network simply to boost your number of connections. Capture what you learned by writing a blog post or presenting a lunch-and-learn for your company. If you found the information to be inspiring, it’s likely that others will enjoy it, also. It may turn into a brainstorming session and bring about new and exciting ideas for the coming year! Plus, sharing what you learned will show your leadership team how valuable the conference was and you will be able to sign up for the next event.